The Richer Life Lab Podcast gives you everything you need to take control and upgrade your money, career, and life. Hosts Laura Adams and Kate Rodriguez offer experiments and fresh approaches to old problems in a lively, thought-provoking format. You'll hear concepts, research, and personal experiences that move you from ideas to actions and create daily habits that add up to transform your life. We examine topics where money, career and life intersect -- and share tips on how you can get ahead in all 3 areas. When you control your finances, build a career based on your passions and talents, and spend more of your personal time doing things you enjoy, you're building a richer life. Living rich isn't just about having enough money. It's also about embracing the right mindset and forming positive habits that help you achieve your dreams, whatever they are! Follow along for weekly inspiration that sparks a revolution in your mindset and results. Kate is a freelance writer who specializes in career search and professional development. She's worked as a university career coach, career service marketing manager, international trade analyst and business consultant. As a mom of two kids, she's also a pro at maximizing productivity, keeping family finances under control, and being thankful for the everyday riches money can't buy. Kate values variety in work and life -- originally from South Carolina, she now lives in beautiful Munich, Germany. Be sure to follow the hosts on Twitter at @KateCareer and @LauraAdams. 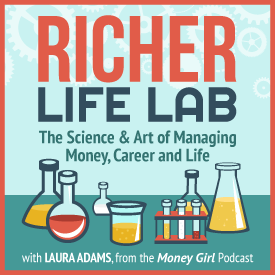 Richer Life Lab is a podcast that gives you everything you need to take control and upgrade your money, career, and life.